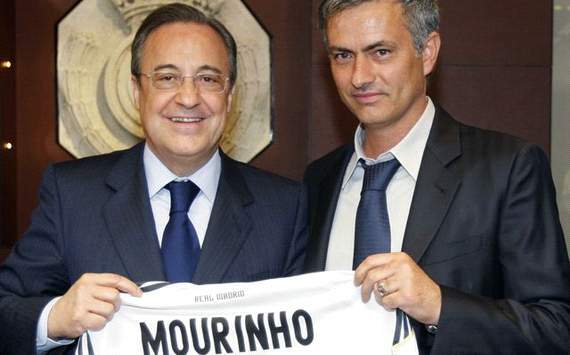 Real Madrid president Florentino Perez has given a vote of confidence to under-fire coach Jose Mourinho, who has been the subject of harsh criticism from a fraction of the club’s supporters and parts of the media. Los Blancos find themselves trailing league-leaders Barcelona by 11 points and have been not been up to par with their usual standard in the Champions League, finishing second behind Borussia Dortmund in Group D.
With rumours circulating that Mourinho is on the radar of French giants Paris Saint-Germain, it has been speculated that the Portuguese may leave the club, but Perez has moved to squash such reports and voiced his unwavering support for the two-time Champions League winner. “I want to express my appreciation, my confidence in his work and my love for him as person,” Perez said at a press conference. “We have the best trainer in the world. He has an impressive record and he is more ambitious to win trophies than anyone. “Mourinho has endured attacks and unfair criticism, some of them aimed at his dignity as a person. We have built a dream team and we play spectacular football with the ability to meet our objectives. Real Madrid host Espanyol on Sunday and will be hoping to close the gap to leaders Barcelona, who play second-placed Atletico Madrid later in the eveing.